Quaint and Quirky: Happy New Year, Happy Camera! Happy New Year, Happy Camera! From my parents, Josh and I received a small digital camera. I've wanted a small digital camera for a while so it can go with me easily and I can take pictures spontaneously. Small digital cameras in big bags need cases though. Some Internet research helped me to find the CUTEST CAMERA CASES EVER! Camera cases that look like cameras! The felt LCD screen is really a little pocket for the SD card. Not as cute as the originals, but I like it! My next news is that I have committed to take a picture a day this year. I've wanted to try it for a while now, but have always had a LARGE camera. This is the year! I'm going to try to post every day.... we will see how that works! Stop by every now and then to check out my photos! Too adorable! I love all of the little "camera" details, and that LCD screen is so clever :-) You're always such an inspiration! Oh, that is SO cute! What a clever idea! 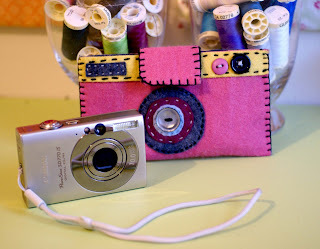 Cute camera case! Good luck taking yoru pics every day! So, if you don't like years that end in odd numbers, does that mean that you only like scalloped trim and not pointed? Very cute! 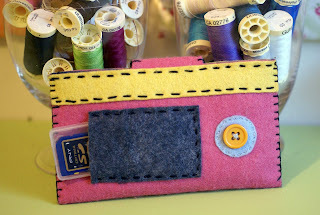 Funny I got a small digi camera for Christmas too and I was thinking I will have to make a case for it! :) Mine prob won't be all as detailed as yours though. These days I'm all about super quick and super easy! I thought your camera case was one of the ones in the website you posted. It looks so much alike. It sure turned out great, and I love it! love the little bag--so sweet. good luck with the posting goal.